The first post in this series detailed the reasons behind the introduction of IEC 61439 while my second post covered rating current of protection devices. Complying to the standard and implementing its guidelines help ensure that LV electrical switchboards and panels work like they should. That improves electrical safety and lessens the chance for a lack of service continuity, thereby reducing downtime and associated costs. For designers, this is a way to build business – by specifying a more reliable equipment, system or assembly. In this post, I’m going to outline reasons why and how you should satisfy clearances and creepage distances. This is important for power availability, a vital issue impacted by local conditions around the world. India, for instance, has, unfortunately, experienced blackouts covering 670 million people. Section 10.4 of IEC 61439 provides the list referred to in IEC 60664-1, the basic safety publication “Insulation coordination for equipment within low-voltage systems”. This shows the minimum clearances and creepage distances by nominal, or rated, voltage and overvoltage, or rated impulse withstand voltage, under different pollution levels. The pollution degree is from 1 to 4 in the standard, and for a panel or switchboard installed in an industrial area the pollution degree is defined as 3. For example, suppose the nominal voltage (Ui) is 1000 V and the overvoltage category is III. 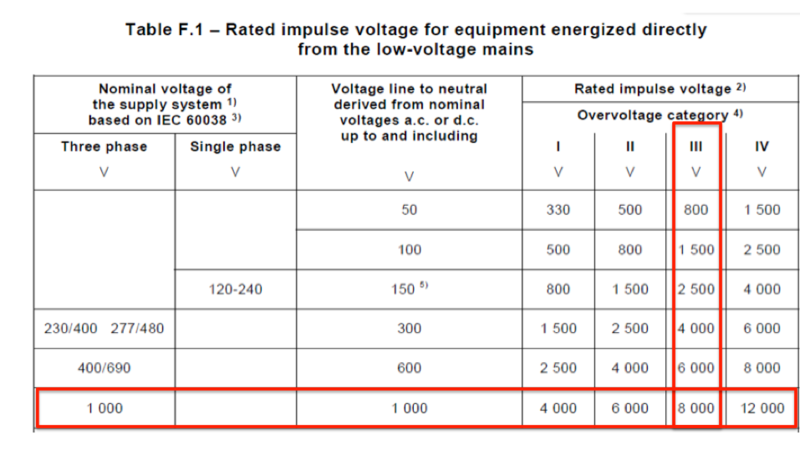 Then the rated impulse voltage (Uimp) is 8000 V, as per table F.1 in IEC 60664-1. 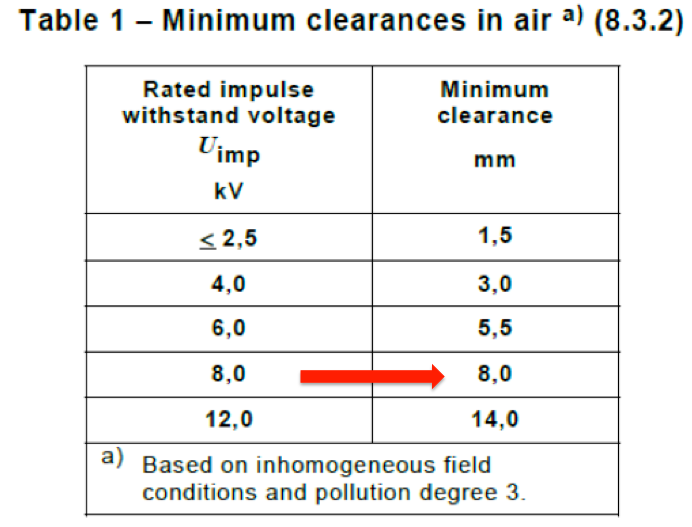 With this impulse voltage (8,000 V), and a pollution degree 3 (an industry environment), the minimum clearance should be 8 mm as shown in Table 1. IEC 61439 suggests that the panel builders perform the routine verification for clearances and creepage distances. If the design distances are respected, the panel builder gets the guaranty of the performances to almost all types of over voltages and installation environmental constraints. In addition, according to the IEC 61439-1 section 10.11, the original manufacturer shall make sure the clearances or creepage distances are compliant to the standard even after a short circuit test. Using the methods of standard to design and test a switchboard avoids such problems as dielectric failure, reduced creepage or clearance, and other electrical safety risks. On the rare occasions that lightning strikes nearby, this can significantly increase the risk of grid overvoltage. However, it is also important to be aware that the simple action of switching equipment on and off – which is a regular occurrence in most buildings – can similarly cause overvoltage. Therefore, it is essential to choose the correct design, to ensure electrical safety. That will be the case if your panel meets the standard. However, as can be seen by the example above where the minimum clearance was calculated to be 8 mm, verifying compliance to the standard is not always an easy or a simple process. Multiple steps are required, along with looking up values in various tables. Third party certification, an advantage in IEC 61439 compared to earlier standards, can help with this. Thanks to such a certification, specifiers can be sure that what comes from switchboard component suppliers and original manufacturers implements the recommendations of the standard. As a result, designers can concentrate on other parts of a project, while still being sure that the resulting system will work as it should now and will continue to do so for the rest of its operating life.